All content on this website is published under a Creative Commons Attribution-ShareAlike 4.0 International License. 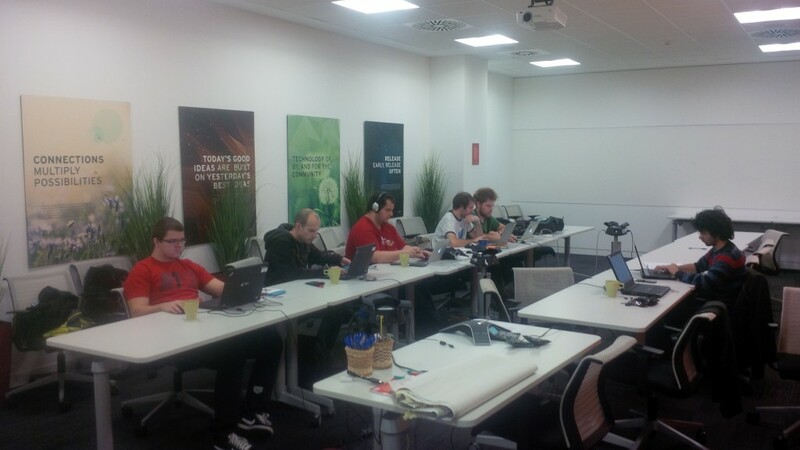 The KDE PIM sprint in Brno, Czech republic starts this Friday, but some KDE developers just could not wait and decided to come to Brno already on Monday to work with the Red Hat KDE Team. Some of the stuff we are hacking right now is PIM related, but we also want to use this few days to work on other projects that we are involved in, but that are not strictly related to KDE PIM. David Edmundson and Martin Klapetek have been working on creating Plasma theme for SDDM (a new display manager that for example Fedora intends to ship instead of KDM), and today they've been improving KPeople, the meta-contact library used by KDE Telepathy and that they will also integrate with KDE PIM. My colleagues Lukáš Tinkl and Jan Grulich are working on plasma-nm, the new Plasma applet for network management in KDE.